You can pick up the whole watch for $30 at Soviet Rarities. It looked like it was in pretty good shape for the money. Last edited by hondapower2.2L; June 8th, 2013 at 09:36. I am looking for an original crown for my newly purchased solid gold Raketa 23. The case is small, 33 mm, and it is pink gold color, as usual for a Russian solid piece. Thank you. If you have a non working Elektronika B6-02 that has a logo panel in good conditions, like the one in the picture below (the Elektronika or ZIM logo and colour of the overlay doesn't matter to me, as long as it's in good condition), please let me know by sending me a PM. Thank you WUS for allowing me to post this request. Last edited by vpn; July 4th, 2013 at 11:54. Anyone who can help me to make this watch complete? I miss the black seconds hand. Would anyone happen to have an hour wheel for a Vostok 2416b movement? I need two (if possible) click-wheel springs for a Poljot 2614 movement. 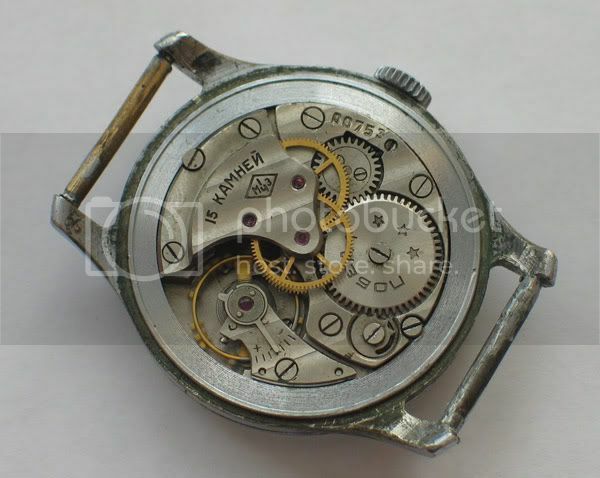 I'm trying to avoid sacrificing working watches for parts, so if you have just the springs or even a non-working Poljot 2614 movement, please contact me. Thanks!